Increased fertilizer, fuel, and equipment costs have made stored forages an expensive commodity. The forage produced in pastures has likewise increased in value. Good pasture management offers the opportunity to lower sheep production costs by utilizing the animal to fertilize and harvest the forage. Often pasture management discussions center around rotational grazing principles. In this article I want to consider another aspect of pasture management. Do your pastures contain the species mix and varieties that will give you a maximum response from applying rotational grazing principles? For some producers this may mean establishing a new pasture or renovating an existing pasture. Bob Hendershot, NRCS State Grasslands Specialist, speaking to the Athens County grazing council, once said that no corn or soybean producer would consider using seed varieties and genetics from 20 or 30 years ago, yet many livestock producers in their pastures have grass and legume genetics that are that old and older. Visitors to the Cline farm in Athens County for Ohio Sheep Day on July 12 saw examples of various pastures that had been recently established and/or renovated. Curt Cline sees the use of improved grass and legume varieties as a necessary step to increase pasture productivity. However, in these times of higher input costs, will this type of investment pay off? Let’s take a closer look at some of the economic considerations of pasture renovation supplied by the Cline farm. Given the high cost of nitrogen fertilizer, one of the first places to start a pasture renovation project is to add legumes to predominantly grass pastures. In 2005, Curt planted a pure stand of Tekapo orchardgrass, an improved variety sold through Ampac Seed Company. At that time Curt’s plan was to use this field primarily for hay production and secondarily as a supplemental pasture field. Nitrogen fertilizer was applied 2 to 3 times per year. By the late fall and early winter of 2007/08 fertilizer prices began to quickly climb, signaling some new economic realities. Curt was also shifting his management priorities away from hay making to pasture management for better sheep production. A decision was made to add some improved legume species to the Tekapo orchardgrass field. In late March of 2008, 10 lbs/acre of Barenbrug “Start” variety red clover and “Alice” variety white clover were broadcast into the field. Generally, our OSU recommendation would be 6-8 lbs/acre of red clover seed in a spring frost seeding. Both of these legume varieties are recommended for grazing situations. Sheep were used to graze the orchardgrass stand down close to soil level and to hoof in the clover seed. Sheep were removed from the field 5 days after the clover seed was broadcast. Several frosts also occurred during this period. The cost for the seed and broadcasting totaled $59.93/acre. Visitors to the Cline farm during sheep day were able to observe that the field now has between 30 to 40% clover in the stand. At this level, the clover is supplying the nitrogen requirements for the stand. At current nitrogen prices, an application of 50 lbs of actual nitrogen/acre will cost about $44/acre including spreading. Just on saved nitrogen fertilizer costs alone, the seeding costs will pay for themselves in the first year. In addition, sheep now have a higher quality pasture forage to graze. Another way to renovate pastures is to do a new seeding to establish both improved grass and legume species at the same time. There are two windows of opportunity to do this in Ohio. The first is early spring. March through about April 15-20 is the preferred time period. Planting later than this increases the risk that the new grass and legume plants will not be established before hot and dry weather arrives. If this happens, stand survival can be low. The second time period is a late summer seeding. The timing is late August until about the first week in September. Remember that the new forage plant, grass or legume, needs about 6 to 8 weeks after germination to become fully established. Our average first frost date in Athens County is around October 15, so counting backwards from that point provides our target planting time. Of course, some years we do have an extended growing season and forage seedings made after the first week in September succeed. However, with rising seed, fuel and machinery costs, it becomes a more expensive gamble than in the past to push planting times past recommended dates. Late summer seeding can provide more time to plan for seedbed preparation and/or chemical control to knock back existing weed and plant competition. Seed placement and amount of seed is important, so take time to calibrate the drill and insure that seed will not be placed too deeply. Seeding depth for most cool-season forages is one-quarter to one half inch. It is probably better to be on the shallow end of that range. Soil pH should be at least 6.0 for grass seedings and closer to 6.5 if legumes are being included in the planting mix. Minimum soil phosphorus and soil potassium levels should be 20-25 ppm for phosphorus and 100 ppm for potassium. On the Cline farm, Curt had a number of acres of poor, unimproved pasture fields.Some of the lack of productivity is due to poor soil fertility.However, as Curt works on raising soil fertility to critical levels, he also has a goal to establish improved permanent pasture species on some of these acres.As part of his strategy to manage internal parasites, Curt is using annual forages such as sudangrass and sorghum x sudangrass hybrids within the grazing rotation.Curt is using some of his poorer pastures and converting them to annual forage production.When the annual forages come out of production this provides an opportunity to do a late summer seeding of cool season permanent pasture mix. In 2007, Curt used a Brown Mid Rib (BMR) Sudangrass to graze lambs from mid July through September 11. After the last grazing pass the field was tilled and seeded into Ampac Seeds “Pasture Perfect” mix on a portion of the field and Barenbrug “Horse Master” mix on another portion. The Pasture Perfect Mix was seeded at 30 lbs/acre and the Horse Master mix at 25 lbs/acre, according to company recommendations. An additional 7 lbs/acre of Start red clover and 3 lbs/acre of Alice white clover was broadcast on a portion of the Barenbrug planting in spring of 2008 because the legumes appeared thin. The stand was slow to establish, in part because the seeding took place later than the last recommended seeding date, but mainly because soil conditions were very dry. In Athens County, the drought of 2007 didn’t end until rains began around mid-October. The seed, tillage and planting costs averaged $158/acre for the Pasture Perfect seeding and $151.83/acre for the Horse Master seeding. Since these are perennial forages, seeding establishment costs should be spread over a 4 to 5 year period. If we use 5 years and an average between the Ampac and Barenbrug seed costs, this permanent pasture stand establishment has a cost of about $31/acre. Starting with this establishment cost, we can add other production expenses and figure out what it will cost to produce a pound of dry matter (DM). This is where each farm will vary. Some farms have higher fertility and production capability as compared to others and this can provide an economic advantage. For example, on some of Cline farm fields, soil fertility is low. Many pasture paddocks need to increase soil phosphorus levels by 10 ppm and soil potassium by 20 ppm to reach the minimum or critical levels cited previously. This will require about 100 lbs/acre of actual P2O5/acre and 100 lbs of actual K2O/acre. If DAP and Potash are the fertilizer sources used, this amounts to 218 lbs of DAP/acre and 164 lbs of potash/acre. At current fertilizer prices this will cost $178/acre. Fertility wasn’t depleted all in one year, and it’s not realistic to restore the fertility in one year. This is an expense that has to be considered over a longer time period. I will use a 5-year period as was used to amortize the seeding cost. This results in a fertilizer expense of $35.60/acre. Lime is figured at a rate of a 2-ton/acre application every 4 years. This results in another $12/acre. Finally, we can consider a land charge. One way of figuring this expense is the value of the pasture on a rental basis. One method of figuring this is to use pasture rental as 70% of row crop rental. In Athens County, row cropland is renting at about $50/acre, so I will use a land charge on this improved pasture of $35/acre. The total expenses per acre amount to: $113.60 in our example from the Cline farm. Next we need to consider production. On May 14 of 2008 2×2 foot clipping samples were taken on the fall seeding pastures and a sample was oven dried to determine DM. The results indicated about 1780 lbs of DM/acre. On a conservative basis, this new seeding should produce about 3500 lbs of DM/acre in this first production year. The cost to produce a pound of DM is: $113.60/3500 = $0.032. By next year we would expect that production to be at least 3.25 tons/acre of DM or 6500 lbs. The cost to produce a ton of DM will be: $0.017. We can now figure out an approximate cost of gain for grazing lambs. A 60 pound lamb eating 4% of its body weight /day in DM needs 2.4 lbs of DM/day. In 2008, lambs have been weighed every 2 weeks on the Cline farm. 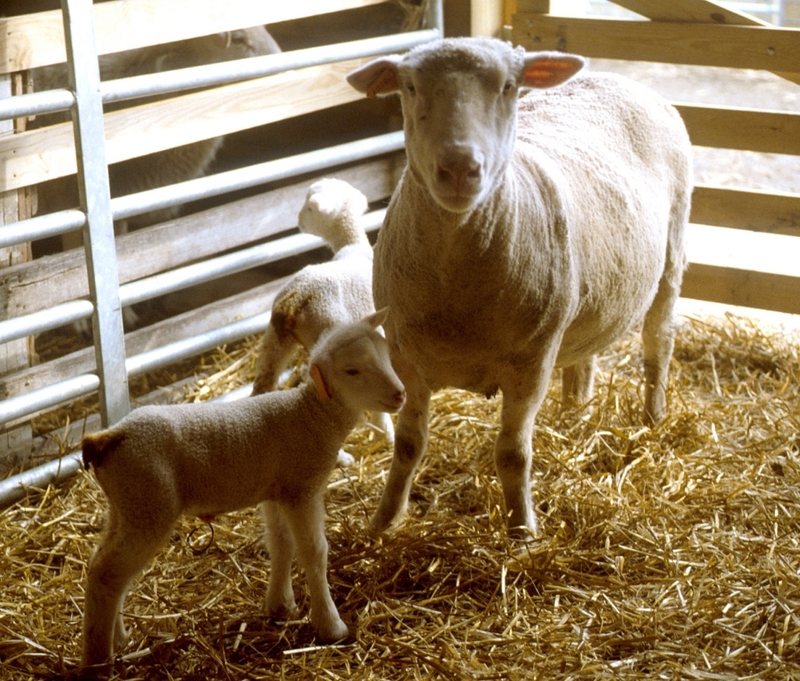 Through July 8, lambs were averaging about 0.25 lbs/day on pasture. So, every 4 days they gained a pound and consumed a total of 9.6 lbs of DM. Using 1st year seeding production levels the cost/lb of gain is $.032 x 9.6 = $0.31. With established stand tonnage, the cost/lb of gain is $.017 x 9.6 = $0.16. Corn at $7.00/bushel equals $0.125/lb. At a 3.5 lb to 1 lb of gain conversion, the cost is $0.44/lb, and that doesn’t count the cost to feed the corn, the facilities needed to handle the corn, or the cost of manure handling in this type of feeding system. It’s hard to beat pasture. Let’s push the envelope a little further. Once a pasture has soil fertility brought up to the critical levels then good grazing management, by using smaller paddock divisions and higher stocking densities, can maintain even manure distribution and soil nutrient levels. If legumes are evenly distributed at 25 to 30% throughout the paddock, then synthetic nitrogen fertilizer should not be needed. Little to no synthetic phosphorus and potassium fertilizer cost should be necessary. We still may want to include a lime cost of $12/acre, as well as a land charge at $35/acre. We might even want to keep our $31/acre seeding cost, to cover frost seedings and stand renovations to keep up with improved forage genetics. If so, then once fertility levels are established the per acre costs total $78/acre. At the 3.25/acre DM production level (a conservative figure for well managed pastures) the cost to produce a lb of DM is $0.012. If lambs gain .25 lbs/day, the cost/lb of gain is $0.11. Posted by Braden Campbell at 7:36pm January 4, 2019 Posted in Economics and tagged Economics, Forages and Pasture. Bookmark the permalink.